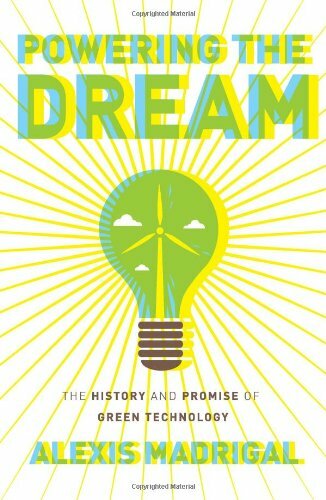 In a world reeling from the news of the nuclear plant failures at Fukushima, no book could be more timely than Alexis Madrigal’s Powering the Dream. Headlines filled with nuclear disaster and soaring oil prices have reignited the energy debate while news stories about alternative energy focus almost exclusively on the sexiest new technology. What’s lacking is contextual background and perspective. Powering the Dream provides that. From our perspective the path from horse and wagon to 18-wheeler appears as an unwavering line, but the truth is we stand on a scrap heap of abandoned energy technologies, virtually all of them kinder to the environment than those we depend on today. Be prepared, as you read this book, you may find yourself wondering what decades of concentrated research and development might have meant to some of these technologies, a sense of regret for Worlds of Tomorrow that never were. Electric cars? In 1900, you could have driven across NYC in an electric powered taxicab. Windpower? In the American Midwest, six million water-pumping windmills made farming possible in the dry western plains. Compressed air energy storage? In Paris, in the 1890s, energy was carried throughout the city by compressed air, not electricity. A network of pipes transported it to shops, factories, and a citywide array of perfectly synchronized clocks. This book is far from a dull scientific read. Mr. Madrigal is a storyteller. He seems naturally drawn to the drama of success and failure and the fascinating eccentrics and visionaries that taken part in the battle of energy technologies: visionaries, like John Etzler, whose 1830 book promoted his idea of a utopian society powered by water and wind, Edwin Drake who gambled on drilling for oil in Pennsylvania in 1859, or Palmer Putnam who brought the first one megawatt wind turbine online in 1941. It helps that the author has a very dramatic story to tell. Demand for energy paralleled the astonishing pace of America’s rapid industrial growth, and throughout the 19th and 20th centuries, energy meant opportunity. In 1830, there were just 23 miles of railroads in the United States, by 1890 that had risen to 164,000. In 1830, Chicago had a population of 50, by 1890 it had become a million. The very design of cities evolved because 19th century industries relied on steam power and steam couldn’t be transported over great distances. Over the course of a century, the power to drive American industry shifted from water, to steam, to electricity, each of those shifts is a story in itself. Ultimately the story of energy boils down to a story of money. Mr. Madrigal suggests that the value of the worldwide energy business may be as much as six trillion dollars. While venture capitalists, enticed by that titanic market venture capitalists have plowed billions into green-tech startups, most new energy sources look to the government for funding. In the United States, this has been frustratingly inconsistent as legislators are blown this way and that by the winds of political change. “Businesses lived in constant fear that their tax incentives would be cut by capricious lawmakers, which made it hard to make sound long term decisions.” But other energy sources had no such problem. The oil industry received a steady tax break from 1913 to 1975, and the government threw its wholehearted support behind the nuclear power industry. In the early 1970s, nuclear power plants seemed the only possible means of meeting estimated future energy demands. Hundreds of new reactors would have been needed. Artificial pricing also made nuclear energy appear attractive. General Electric offered to build nuclear power plants at a price well below actual cost. Mr. Madrigal suggests the actual price for nuclear-generated electricity may be several thousand dollars per kilowatt. The most difficult challenge green energy faces is the low cost and convenience of fossil fuels. Oil is “energy dense,” that is, it packs more power per volume than other fuels, like storage batteries. This is what drove the electric vehicles of the 1890s off the roads and onto the scrap heap. Gasoline remains a formidable challenger for today’s electric powered vehicles. Gasoline’s Achilles’ heel is price. As the cost of oil per barrel climbs, other energy sources appear more and more attractive. But even using less coal may have a negative environmental impact. The less coal developed nations use, the more its price drops, which makes it even more appealing to developing countries, as a result more pollutants enter the atmosphere. Mr. Madrigal calls this “the backfire effect,” and it serves as a reminder that solutions to environmental problems are rarely simple and almost never without consequences. The main advantages of renewable energy sources are that they burn nothing, generate no waste, and release no CO2 into the atmosphere; however, they tend to be variable. Solar power provides energy only when the Sun shines, wind turbines turn only when the wind blows. To overcome this limitation “the overall energy system has to be shaped so it can accommodate natural energy flows.” The answer is to find a way of storing energy. Re-enter compressed air. Plans are underway to use renewable energy plants pump salt caverns full of compressed air, which can then be extracted when inputs fall, a technology that brings us back to Paris of the 1890s, not a bad place to end up. My one quibble is with this book is its organization. The author has opted for a roughly chronological scheme that scatters information about a single energy source through several different chapters. You may find yourself flipping back and forth as you try to follow the story. The most helpful feature may be the summaries that appear at the end of every chapter. Mr. Madrigal sums up the purpose of his book very succinctly and clearly: “The bottom line is that we’ve missed chances to have a cleaner energy system, and if we don’t heed the lessons of the past, we could blow this opportunity, too.” Those who are concerned about the future of energy and the environment will find Powering the Dream a very informative and useful resource. W. R. Stephens has been covering the alternative fuels industry for close to a decade. A longtime freelancer, he enjoys variety, and has written about subjects that range from national security to the 1920s literary scene.